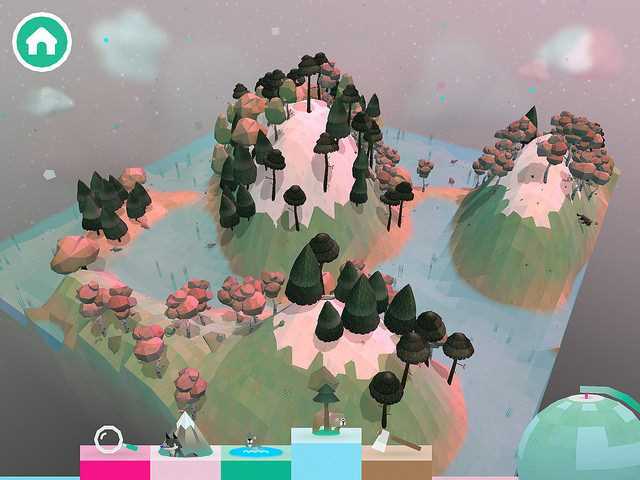 This captivating nature sim shimmers with life! By joining in, parents can make it truly educational. 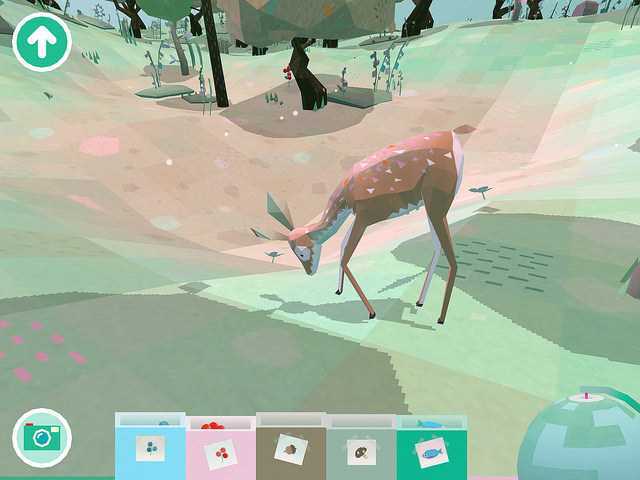 In Toca Nature, a simulation game, kids shape land into mountains, forests, and rivers to create habitats for creatures such as bears, rabbits, foxes, and more! 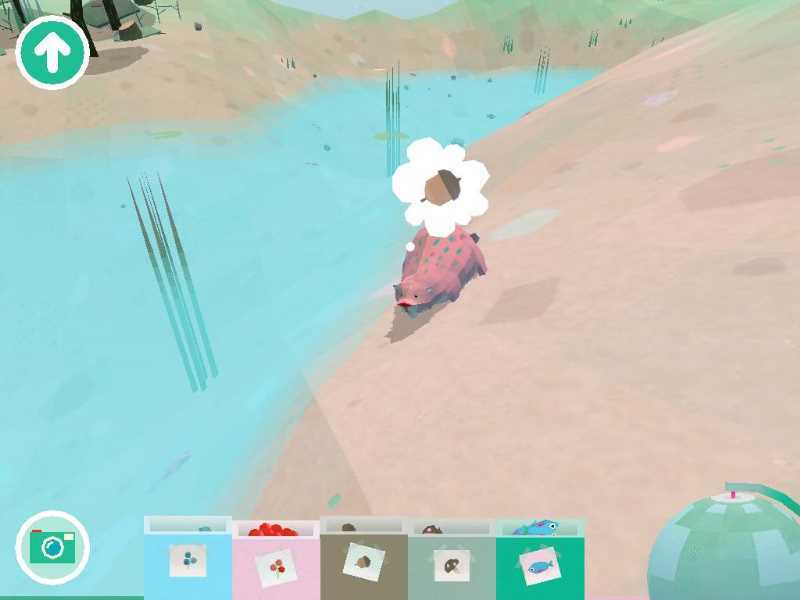 After creating a world, kids zoom in and gather plants and fish to feed the animals, and then zoom back out to keep shaping their world. Except for the occasional fish skeleton, this is a peaceful version of nature -- none of the animals eat one another, and the only shooting is with your camera to snap a photo for your album. Kids start out in creation mode, where they see a topographic tile of land and a palette of natural features: mountains, water, and five different types of trees. Tap on the mountain tool, then drag and hold to watch the earth rise, maybe even high enough to gather snow on top! Each of the features is associated with a different animal; when you add enough of that feature to create a habitat, the animal will appear. Spin the globe for a different point of view, or tap the magnifying glass to zoom in and walk around your landscape. Once you've touched down, it's time to explore! Watch the animals doze or swim in the water. Tap an animal to see how it reacts to your presence. See if the animals are searching for a particular type of food. Share the food from your pouch, and collect more as you walk. As the world darkens and lightens, how do the animals respond? Then, the next time you open the game, start again by creating a whole new world! What we love about Toca Nature is how it uses your device to bring nature to you. Whether you're in the car or in your living room, you can feel the soothing sensation of a walk in the woods, listening to birds whistle while you watch a deer graze for food as leaves gently fall around you. With the mystical music and lighting, and surreal graphics, it's easy to feel like Toca Nature is a portal to a magical, Narnia-like land. You feel almost like a woodland fairy, invisibly sharing food with the animals. It's neat to see how the animals act and react, growing visibly after you feed them. Kids can learn a little bit about what different animals eat from the game. We're glad for kids to have this positive, natural playground, and we hope it inspires families to go outside and seek out natural beauty. Of note is Toca Nature's inability to save the worlds you create. Like most Toca games, there's no way to "win." Since you can't save the world you have worked hard to create, the emphasis of the game is more on creation than on simulation. As much as Toca Nature sparkles with life, it rises to the next level when parents engage kids in a discussion about the relationship between people and nature. 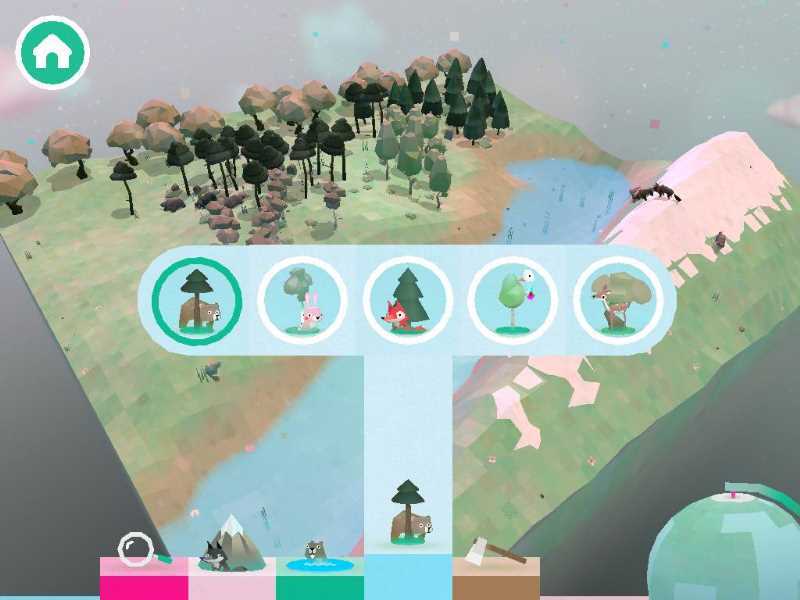 Otherwise, it's easy for Toca Nature to reinforce a vision of humans shaping and reshaping the natural world and gathering its endless resources without any consequences. In order to really learn, challenge your kids to think scientifically -- what would happen in the real world if, for example, you took all the fish from a pond? Would they come back, as in the game? How do bears really react to people in the forest? Check the great "For Parents" section for more suggested discussion topics. 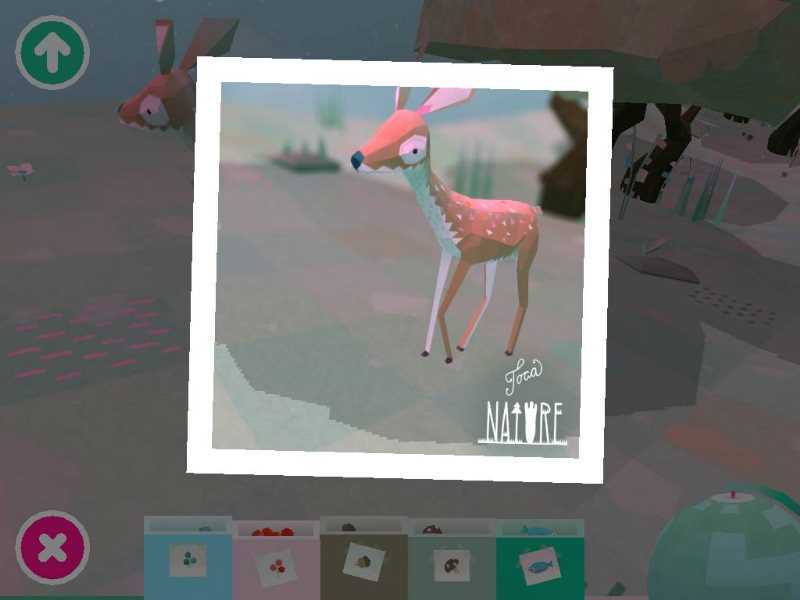 Toca Nature is a great way to introduce your kids to observation and awareness skills that can enrich their experience of the real natural world. 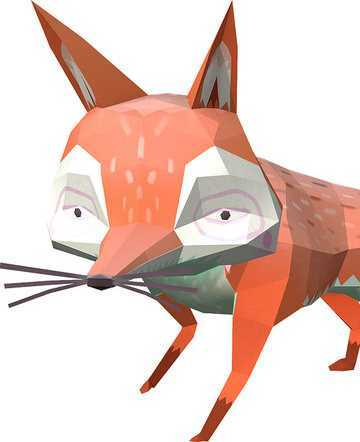 Toca Nature is best for kids who enjoy creating and exploring and don't mind somewhat cubist graphics. It's an engaging way to introduce artistic kids to science: imagine the land as your canvas and the trees as your paintbrush and see what you can create! Then go closer to see how your creations act, react, and interact together! This Toca Nature app review was written by Liz K. McKinney.